Mercer Ellington (March 11, 1919 – February 8, 1996) was an American jazz trumpeter, composer, and arranger. 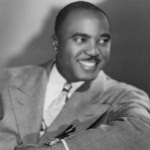 Mercer was born in Washington, DC, the son of the composer, pianist, and bandleader Duke Ellington. He attended New College for the Education of Teachers at Columbia University, New York University and The Juilliard School. In 1939, 1946–1949, and 1959 he led his own bands, many of whose members went on to play with his father, or to achieve independent fame. During the 1940s in particular he wrote pieces that became standards, including “Things Ain’t What They Used to Be”, “Jumpin’ Punkins”, “Moon Mist”, and “Blue Serge”. He also wrote the lyrics to Hillis Walters’ popular song, “Pass Me By” (1946), which was recorded by Lena Horne, Carmen McRae and Peggy Lee. In 1960 he became Della Reese’s musical director, then in 1962 went on take a job as a radio DJ in New York for three years. In 1965 he again returned to his father’s orchestra, this time as trumpeter and road manager.